A viable alternative to the long queues at Mustafa’s Gemüse Kebap (and for me the schlep to Kreuzberg), K’UPS Gemüse Kebap has opened on Kastanienallee in Prenzlauer Berg. Legend has it that the Döner Kebap (or Doner Kebab) was invented in Kreuzberg so it’s no surprise that it is one of Berlin’s most popular snacks. 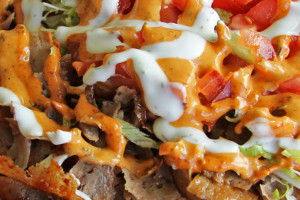 Serving a variation on the traditional lamb or veal (a combination of chicken and roasted vegetables with the usual trimmings), Mustafa’s Gemüse Kebap, is one of the city’s most popular Dönerbuden. As Mustafa’s has been in numerous Berlin guidebooks and has rightly gained a solid reputation, and achieved a kind of cult status, eating there normally involves a considerable wait. Indoor seating: particularly welcome during a Berlin winter. The tables and chairs are repurposed wooden pallets. A significantly shorter wait: that could well change though when word gets around. 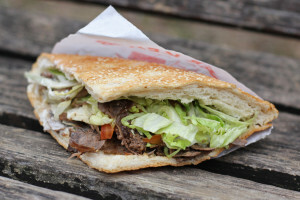 On my two visits to Gemüse Kebap, my Döner was ready within just a few minutes and bang on the money for flavour. 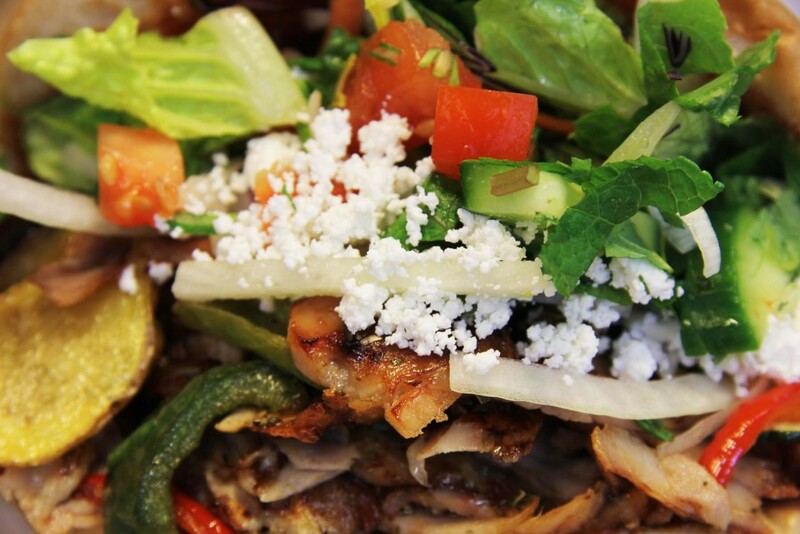 The meat and vegetables were well cooked and seasoned, the salad fresh, the sauce spicy and the finishing touches – crumbled Feta cheese and a squeeze of lemon – for me, the crowning glory. 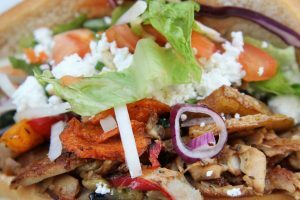 Like Mustafa’s Gemüse Kebap, the new K’UPS Gemüse Kebap in Prenzlauer Berg may well benefit from its proximity to another of Berlin’s landmark eateries. The queues for Mustafa’s sometimes stretch along Mehringdamm to Curry 36, whilst Gemüse Kebap is only a short distance from another of Berlin’s most popular Currywurst Buden – Konnopke’s Imbiß. 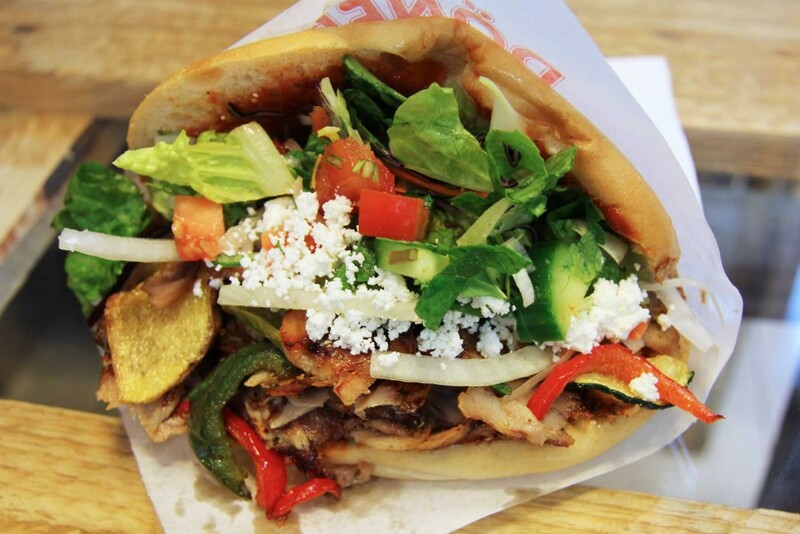 For me, the only thing missing at K’UPS Gemüse Kebap is beer but there are a number of Spätis on Kastanienallee so the beer drinker’s thirst can be easily satisfied. 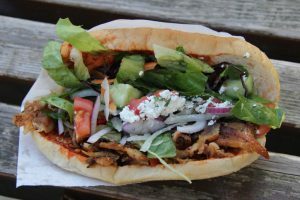 And it’s also very near Berlin’s oldest Biergarten – Prater Garten – so in the summer, a Kebap will be the perfect food for soaking up a few Feierabend beers. Sounds great, thanks for the post. Would like to check it out this weekend, is there a building number or cross street you can give us? Brian, I think the address is Kastanienallee 102 – it’s pretty much opposite Prater, just south of U-Bhf Eberswalder Strasse. I knew the little secret why this place has same quality as that of Mustafa’s. In 2014 I had stood many a time in long queue at Mustafa and know ( by face ) couple of people working there. After few month they left job and stared their own. And in late 2014 I found about this place accidentally from my colleague and fell in love with this new place. Now coming back to mid 2015 those 2 people have left this place and stared a new one. As I don’t yet speak Deutsch very well , couldn’t understand why they left the 2nd place.